My most popular tutorial of 2014 was my guide to creating a realistic money effect in Photoshop, which explained the steps to achieve an authentic engraved illustration style. The process is quite time consuming, so I figured it would be useful to follow it up with a ready made Photoshop Action that produces the effect automatically with just the click of a button. 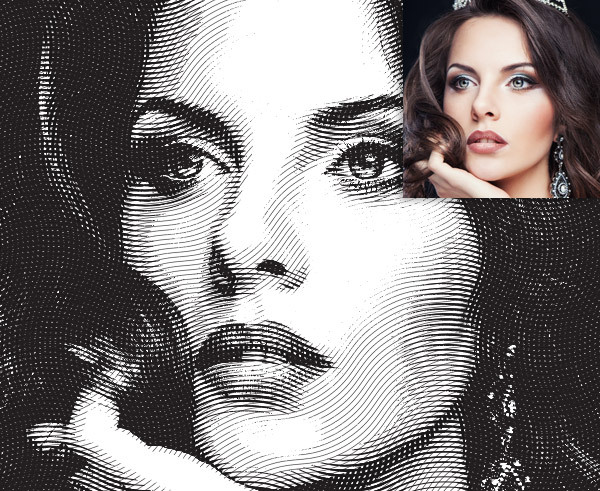 Choose from 3 levels of detail for your image, then the Action will transform your photo into a realistic engraved illustration. This free Photoshop Action transforms your photographs into realistic engraved illustrations with the click of a button, allowing you to easily create money or wood cut style effects. 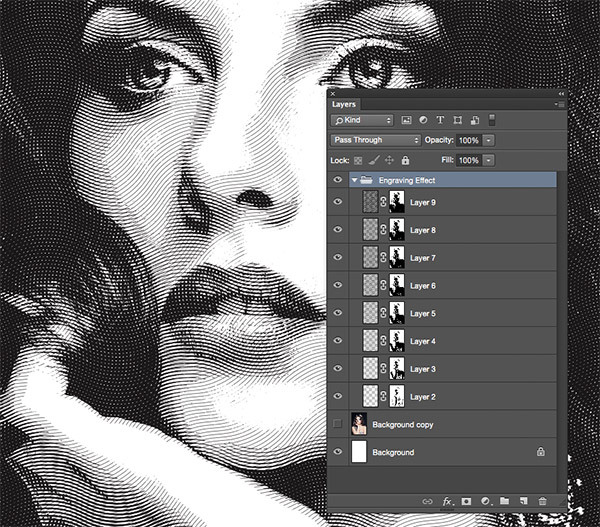 An unwanted moire effect has appeared on these scaled down preview images, but at 100% scale you can see the fine detail of the engraving lines that build up the illustration with multiple tonal layers. If you want to experiment with this effect yourself, don’t forget to check out my original money effect Photoshop tutorial. 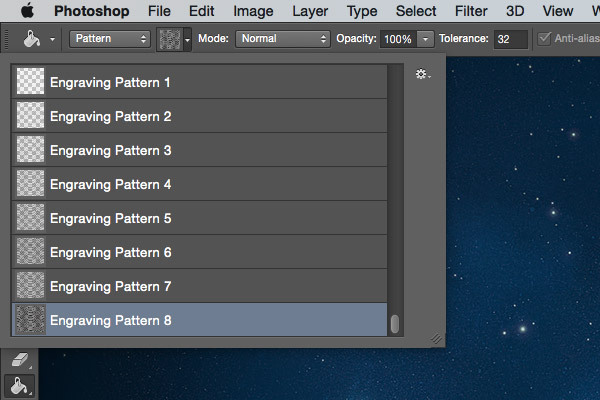 The download package contains the Photoshop .atn Action file and a .pat Pattern file. Load the Patterns first of all so the series of Engraving Patterns are available for the Action to use. Make sure your image is contained on the Background layer, then choose one of the three levels of detail from the Engraved Effect Action. Press the Play button at the bottom of the Actions panel to apply the effect. 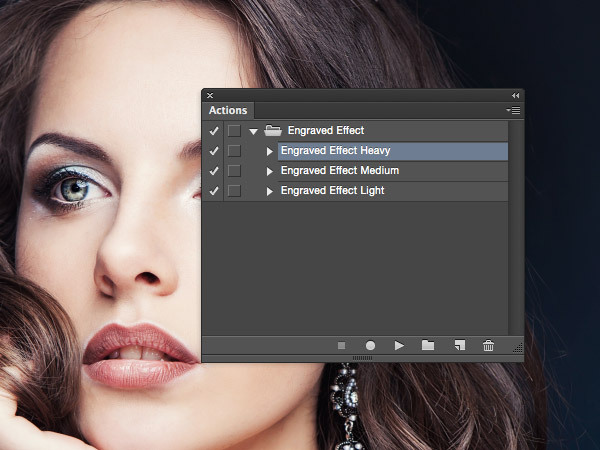 The engraved effect layers are neatly contained within a layer group. Unlink the layers with their masks in order to scale the group down in size to produce a more detailed pattern effect. 107 Comments submitted Add yours! Hello, I tested the action and does not work. Maybe be a problem with the language? I have Photoshop in Spanish. I mention this because when I click on the Play button start appearing error messages like: Layer 1 is not currently available, layer 2 is not currently available, layer 3 is not currently available, etc. Could you tell something to help me? Good news everyone, I’ve fixed the issue where the effect would only work on images of a certain size. I was unaware that Photoshop was saving the coordinates of where I randomly clicked with the fill tool. This spot ended up being off-canvas on smaller images, which stopped the process from working. So.. the new version totally works. Great Work!!! Hi, thanks for the great action, i did follow the actual tutorial of this effect before and got amazing results. But i cannot seem to figure out the way to use this action. what am i doing wrong. thanks! Hi, so i just got it to work. like mentioned before… used a bigger image and renamed it as “Background”. That’s where my error has been i guess. and then ‘play’. worked like a charm. :) yaaay! Glad to hear the larger image solved the problem. I’m still confused as to why this even happens! If I figure it out I’ll re-record a new version. This still doesn’t work. I get one error message after another concerning layers. The object “layer “Layer 2” of layer “Layer 3” of layer “Layer 4” of layer “Layer 5”” is not currently available. Stuff happens, but I can’t seem to get it to function properly. kyrsoft.com/articles/atn-translator/ to have the actions translated. I’ve always wondered how to do this, thanks! However, it isn’t working properly on my test. I’m wondering if you can tell me what I’m doing wrong? At this point is has created several layers. The one selected is “Layer 2”, which is empty. There are layers 1-7 which are all empty, plus layer 1 copy and layer 1 copy 2 though layer 1 copy 7, each of which do contain elements of the image. The fill, however, is being run on an empty layer. I’ve just done some testing and found the Action isn’t working on images under 804px for some reason, which is very strange! The step the Action gets stuck on is a simple Select All > Fill, but it works fine (for me) on documents 804px+. Does a larger image work for you? I’m having the same issue, even with large photos. I discovered what was happening – I didn’t have “copy” being automatically appended to duplicated layers, so the action couldn’t find the layers it was looking for. I was having the same problem and I made it to work by first loading (again) the pattern and then loading the action (replacing the action) then will work like a charm. Can people who got it to work post the exact dimensions of the image they used and what version of PS? Got it to work on my home machine. Images were about 3000×2000 running CC 2014 on a PC. Unfortunately, your Photoshop actions only work with English language Photoshop versions. It would be helpful, if you mention this in the Readme files. If you rename the layers in your actions, they might work in other languages, too. Is this something that only works with older versions of Photoshop — or doesn’t work with Photoshop CC 2014? I could not get this to work correctly at all. It seems to have created several layer copies, but kept giving me a “The command threshold is not currently available” message — which I have no idea what that means. Wish it had worked. Same problem here. I run a new version of PS CC. Would really like this to work. It came out really wonderfully. Thanks Tatiana, I’m glad to hear it’s working! I like this photo processing. It’s great. The Photoshop Action makes it easy too! I think they do actions in different languages. Perhaps you could run one and see or contact them. Otherwise, maybe it has to be made in different languages. I really don’t know. This is a nice cap to an excellent tutorial. I had thought about recording the process as an action, but you’ve beaten me to the punch. Nice work Chris! I’m curious – the moire patterns you mention early in the tutorial are apparent in my images too – regardless of whether I scale the image or the effect up or down – they also appear in print. This isn’t restricted to images treated with your plugin Chris. I make a lot of images in Photoshop that involve very tight line work, both raster and vector, and moire seems to be an unavoidable side effect. I wonder if you’ve found any solutions – I have yet to locate one. I’d like to learn how to control the visibility of moire patterns – sometimes it can enhance an image, but sometimes it detracts. Wouldn’t it be wonderful to find a way to eliminate the effect when we don’t want it through simple application of a layer mask? I have a problem using this action. I’m using an English version of Photoshop CS6 and my layer is named “Background”. These are the only issues that I’ve read concerning problems. Is there something else I need to look for? Hope I get this to work – looks amazing! This action is excellent and works great in PhotoshopCS4. I feel a wee design session coming on. By the way, after you apply this effect, if you drag the original full color image to the top layer, and shift its blending mode to “color”, you get an amazing full color engraved effect. I’m french, i downloaded it and follow allt he instructions but it’s not working, i don’t understand why, i’ve installed as you mentionned, all good, but it’s not working, please help. Sorry for my english, if someone here can translate it should be amazing ! FR version on my comment. merci beaucoup pour cette version Fr ! After, edit your xml and search and rename word LAYER, COPY, Background, etc. My Language setup is English also I tried 4000 px 300 dpi resolution image and didn’t work. I add picture as “Background” with lock or changed layer name as “Background” but no way it doesn’t still work. When I click on the Play button start appearing error messages like: Layer 1 is not currently available go on like that. What are we doing wrong? Please help us! I really like this site, but this one proves totally useless, – it doesn’t work… I get all these above mentioned problems like of layer names. Is it not sufficient to change language preferences to English in the program to get the Actions to work? Do I need to have a different version of Photoshop installed. This is not me being unappreciative, this is a great site. Adobe clearly messed up here it seems. Thanks a bunch for the great freebies. So cool and Nice, Thanks a lot, Chris…! Thanks for your kind word Moos! Does anyone know if there’s a way to record a universal Action without incurring language problems? But, I thank you for the action, anyway! LOL Sorry about that! Same here. Just won’t work. Reinstalled as mentioned but no go on any size image. Thanks so much! Great effect! I’m really happy you like it Marilee. I am having the same issue over and over again. I tried the suggested solution above, but no luck so far. This is a really cool Effect, and very nice of you to create it & share it with everyone. I really like it. The Medium and Light are both working for me. Thank you…I have been wanting an action that does this for years! Now you can use it to your hearts content, thank you Don. I hope it goes well, Jess. Im having issues getting it to work as well. I’m using cs5.1. Muchas gracias por el regalo. Tendré que practicarlo para lograr grandes cosas. Felicidades por la página, he aprendido un poco más. Hi Chris, I don’t suppose it would be possible to make something similar for us Elements users would it? It’s a really cool effect. Wow, I have been looking for this effect for ages. I was thinking to do it manually. Thank you Chris. Awesome Chris. Thanks a bunch !!! how did you transform the action? There is a script? This is seriously the coolest thing ever. Thanks for sharing! I’m really glad you think so Sarah, thank you. Thnak you. Great Photoshop Action! Maybe DMasson (bonjour Monsieur :-) ) could be so incredibly nice and tell us about his magic trick and how he changed the actions to a french version, so other users with other language versions of photoshop could transform the action into a version suitable for their language too? Renaming the layers, even changing the system language didn’t work… unfortunately. This is the solution. Thanks Olegs. Hi !! it’s just cool ! but I can not use because it says ‘The object “layer 1 copy 4 ” “not currently available’. Could you make a short video tutorial . Thanks in advance! What an amazing Freebie, thank you Chris! The action is superb, and love the various levels available. “All the great things are simple”- Thanks a lot for sharing! Yes, your action sometimes works sometimes doesn’t. But your tutorial is so understandable. Once you understand how it works it doesn’t take a lot of time to make everything by yourself. And you are able to change width/angle/curve of line so to get different result. Thanks again!Great job! The action works great. It looks pretty sweet on top of the original photo too. Thanks, Chris! I’ve been a lurker and downloader of your content for years. hey Chris do you have a tutorial on how to take an image of let’s say a dog and convert to only a black and white image no other colors. But still look like the image. How to load action for portable Photoshop?